In the wildly colorful custom of storytelling from the Midwest, "Prescriptions for Boredom "brings to life many fanciful, eccentric, and earthy characters, from great-grandma Celie LeFlambeau wearing army fatigues when she died and being buried as an "Unknown Soldier" by those who knew her best in her small town, to Uncle Pud whose wartime wounds took away his face but left him with the uncanny ability to inspire those around him. Clark conveys a feeling of the oral storytelling tradition, as if the words have been handed down over generations--family history right alongside Indian tales that waver at the edge of the unreal--at once entertaining and culturally significant. Of the thirty-six superbly descriptive stories herein, twenty are historically accurate while only sixteen are fiction. But as Clark says, "Truth is stranger than fiction, and it's hard to differentiate between the two "
Ruth Ada Clark was educated at the University of Dubuque, Loras College and the University of Iowa. Mrs. Clark has written numerous short stories, an operetta, songs for motion pictures, as well as a memoir published in 2011 entitled "Beauty in Bent Grass." She has retired from her teaching position, still lives in Iowa, and is still writing. 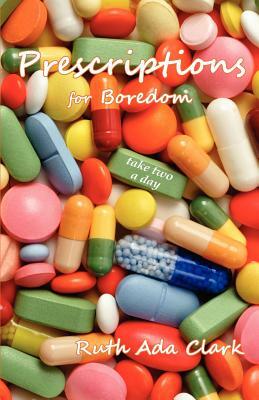 "Prescriptions for Boredom" is Clark's second published book.